Valentines Day Celebration! BMW Book Number 3 Giveaway! 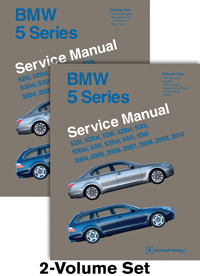 We have one copy of the BMW 5 Series (E60, E61)Service Manual: 2004, 2005, 2006, 2007,2008, 2009, 2010 The BMW 5 Series (E60, E61) Service Manual: 2004-2010 contains in-depth maintenance, service and repair information for the BMW 5 Series from 2004 to 2010. The aim throughout has been simplicity and clarity, with practical explanations, step-by-step procedures and accurate specifications. Whether youre a professional or a do-it-yourself BMW owner, this manual helps you understand, care for and repair your BMW. Selection of Sweepstakes Winners/Odds: There will be one (1) winner for a copy of the book BMW 5 Series (E60, E61) Service Manual. The winner will be selected at random from the members who accurately complete a post on the Sweepstakes thread during the Sweepstakes Period. The winner will be notified via PM and announced through a post on the 5 Series.net Sweepstakes thread after 6:00 PM (Pacific time) no later than than February 15th, 2016 . In the event that a winner is disqualified for any reason, Sponsor may, at its sole discretion, award the applicable prize to an alternate winner(s). Any return of prize notification as undeliverable will result in a forfeiture of any prize and an alternate winner(s) may, at Sponsor's discretion, be selected. Decisions of the Sponsor on all matters relating to the Sweepstakes are final. Sponsor reserves the right not to award all prizes in the event that an insufficient number of eligible entries are submitted, as determined by the Sponsor, at their sole discretion. Odds of winning will depend on the number of eligible entries received during the Sweepstakes Period. Simply post any comment and you will be entered to win! I'm in for a manual. Just got my e61 and need the help. If I get only one book this year, it needs to be this one. Last edited by ericono; 02-11-2016 at 03:30 AM. If I win this, all Ill need is a lifetime supply of Left Hand Milk Stout and I'll be set. +1 on the milk stout! I could surely use the manual. Reading is knowledge, and knowledge adds horsepower, or goes something like that. Quick Reply: Valentines Day Celebration! BMW Book Number 3 Giveaway!